Viking Cruises: Are You Ready to Take the Grand European Tour? Think about this: 15 days of breathtaking scenery featuring the best of The Netherlands, Germany, Austria, and Hungary. Of course, you’ll be exposed to a variety of cultures, UNESCO sites, history, and food as well. And, you may make lifelong friends along the way. Just imagine that you and your partner or group board a longship and sail down the Rhine, Main and Danube Rivers. As you make your way through the windmill-dotted waterways of Holland, the sights and sounds become more vibrant with each passing. If it’s your first time on a river cruise, you wonder why you waited so long to take one. Sound good? Keep reading to discover the Grand European Tour from Viking Cruises. It’s a journey of a lifetime that you simply can’t miss. Sit back and get ready to discover the heart of Europe with the Grand European Tour from Viking River Cruises. Furthermore, you’ll enjoy the Viking Inclusive Value you’ll receive. Ready. Let’s travel! Below is a taste of what you can do, see, and explore on the 15-day Grand European Tour from Viking Cruises. When you arrive in Amsterdam, The Netherlands, you can explore the city on your own or relax on the Viking Cruises longship. If you choose to walk around Amsterdam, you may want to visit the Rijksmuseum, or the van Gogh Museum next door. In the morning, you can tour Cologne, including a visit to the Dom, Germany’s largest cathedral, and UNESCO World Heritage Site. It’s a spectacular gothic masterpiece! After you’ve finished, you can spend the rest of the day and evening getting to know Cologne on your own. In fact, your Program Director can help you plan your free time. See Roman ruins, interesting neighborhoods and wonderful museums like the Fragrance Museum and the Chocolate Museum. Yummy! Enjoy a leisure day in Vienna. Perhaps you see the works of Old Masters at the Museum of Fine Arts. This is amazing enough, but even more remarkable is the fact that – you may join an optional tour to Schönbrunn Palace, the “Versailles of Vienna,” or enjoy a Viennese waltz lesson. Imagine impressing your family and friends at a wedding with your dance skills. 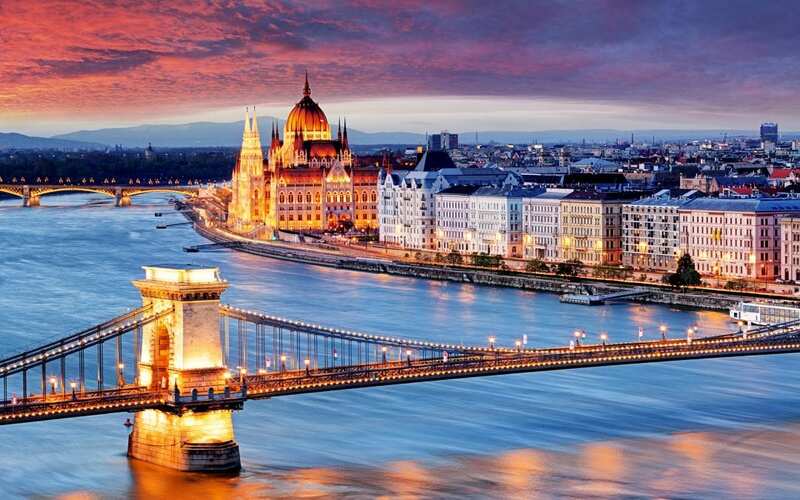 The Danube River divides Hungary’s capital city into the once separate towns of Buda and Pest. You can visit both sides, starting with Pest’s National Opera House and historic Heroes’ Square. In Buda, you can walk along Castle Hill to Fishermen’s Bastion and Matthias Church. Have lunch aboard your longship and explore the city on your own. Or, you may choose an optional excursion to dive deeper into Hungary’s culture and history. Who Else Wants to Cruise Through the Heart of Europe? Imagine you and your partner or friends boarding your Viking Cruises longship for your 15-day journey through the heart of Europe on one of the best European river cruises. Not only do you have a Riverview stateroom with luxury linens and pillows and a hotel-style bed. But you enjoy the multiple dining venues with open seating. You meet other guests and enjoy wonderful conversations. All this is and more possible when you travel with Viking Cruises. Contact your Travel Planners International agent today and ask them the Grand European Tour. Exploring Europe is closer to possible than you think.